The older you get, the greater your breast cancer risk. The correct answer is true. Most advanced cases of breast cancer are found in women over age 50. To help find breast cancer early, all women over 40 should talk with their doctor about what they should do for breast cancer screening. If you have certain risk factors, your doctor may recommend starting breast cancer screening earlier. Men cannot get breast cancer. The correct answer is false. Men can get breast cancer. But their risk is 100 times smaller than a woman's risk. The correct answer is all of the above. Tell your doctor if a close relative has had ovarian, colon, uterine, or breast cancer. You may benefit from enhanced breast cancer screening, such as magnetic resonance imaging (MRI). Most women with breast cancer have a family history of the disease. The correct answer is false. Only 20-30% of women with breast cancer have a family history of the disease. So it's important to be aware of changes in your breasts and get regular mammograms, even if you have no family history. The correct answer is true. Genes called BRCA1 and BRCA2 make proteins that protect against cancer. Having a mutation in one of these genes increases your risk of breast cancer by as much as 80%. If you are of Ashkenazi Jewish descent or have a family history of breast cancer, you may want to talk with your doctor about genetic testing. Your breast cancer risk is higher if you got your first period after age 13. The correct answer is false. Being a late bloomer lowers your breast cancer risk. Your risk is higher if you got your first period before age 12. Going through menopause late (after age 55) also increases your risk. A. Increases your breast cancer risk. B. Decreases your breast cancer risk. C. Has no impact on breast cancer risk. The correct answer is decreases your breast cancer risk. Women who have no children or have them after age 30 are more likely to get breast cancer. Becoming pregnant at an earlier age and being pregnant more than once can reduce your risk. Hormone therapy for menopause can raise your breast cancer risk. The correct answer is true. Using hormones to treat the symptoms of menopause for a long period of time can raise your breast cancer risk a small amount. Most guidelines consider hormone therapy safe for breast cancer risk when taken for up to 5 years. The correct answer is 1 to 2 drinks a day. You can lower your breast cancer risk by sticking to one drink a day or less. Women with a high risk of developing breast cancer should consider avoiding alcohol altogether. Putting on too much weight can raise your breast cancer risk. The correct answer is true. There is a link between obesity and breast cancer, although doctors aren't sure why. One theory is that obese women produce more estrogen, which fuels the development of breast cancer. Consider it one more reason to strive for a healthy weight. Which is most likely to raise your breast cancer risk? The correct answer is none of the above. Feel free to wear any style of bra you like without increasing your risk of breast cancer. Breast implants and daily antiperspirant use also have no effect. Which could be a sign of breast cancer? The correct answer is all of the above. See your doctor if you have any of these symptoms. But keep in mind that early breast cancer most often has no symptoms. That's why regular screenings are important. Some risk factors you can control, such as drinking alcohol. Others, such as family history, you cannot control. The more risk factors you have, the more your risk increases. But, it does not mean you will develop cancer. Many women who develop breast cancer do not have any known risk factors or a family history. Understanding your risk factors can help you know how to prevent breast cancer. Breast implants, using antiperspirants, and wearing underwire bras do not increase the risk for breast cancer. There is also no evidence of a direct link between breast cancer and pesticides. The health care provider will ask about your symptoms and risk factors. Then the provider will perform a physical exam. The exam includes both breasts, armpits, and the neck and chest area. Women are encouraged to perform breast self-exams each month. However, the importance of self-exams for detecting breast cancer is debatable. Most women receive a combination of treatments. For women with stage I, II, or III breast cancer, the main goal is to treat the cancer and prevent it from returning (recurring). For women with stage IV cancer, the goal is to improve symptoms and help them live longer. 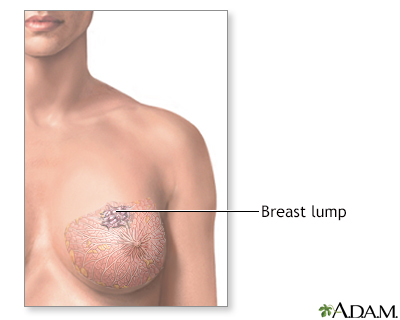 In most cases, stage IV breast cancer cannot be cured. New, improved treatments are helping people with breast cancer live longer. 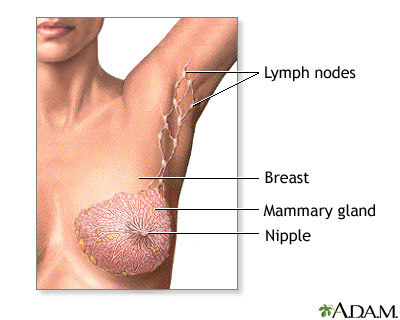 Even with treatment, breast cancer can spread to other parts of the body. Sometimes, cancer returns, even after the entire tumor has been removed and nearby lymph nodes are found to be cancer-free. 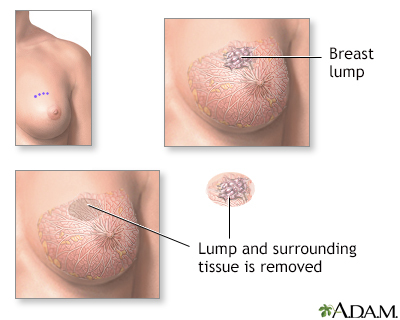 Some women who have had breast cancer develop a new breast cancer that is not related to the original tumor. After considering all of the above, your provider can discuss your risk of having a recurrence of breast cancer. You may experience side effects or complications from cancer treatment. These may include temporary pain or swelling of the breast and surrounding area. Ask your provider about the possible side effects from treatment. Talk to your provider about how often you should have a mammogram or other tests to screen for breast cancer. Early breast cancers found by a mammogram have a good chance of being cured. Tamoxifen is approved for breast cancer prevention in women age 35 and older who are at high risk. Discuss this with your provider. National Cancer Institute website. PDQ breast cancer treatment. Updated March 15, 2019. Accessed April 12, 2019. www.cancer.gov/types/breast/hp/breast-treatment-pdq. National Comprehensive Cancer Network website. NCCN clinical practice guidelines in oncology (NCCN guidelines): Breast cancer. Version 1.2019. Accessed April 12, 2019. www.nccn.org/professionals/physician_gls/pdf/breast.pdf. A needle biopsy is performed under local anesthesia. Simple aspirations are performed with a small gauge needle to attempt to draw fluid from lumps that are thought to be cysts. 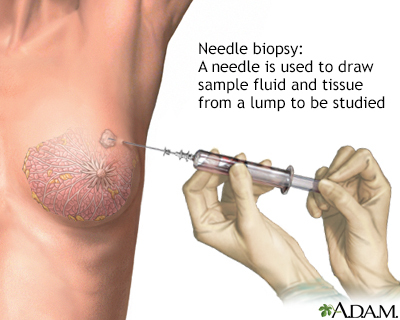 Fine needle biopsy uses a larger needle to make multiple passes through a lump, drawing out tissue and fluid. Withdrawn fluid and tissue is further evaluated to determine if there are cancerous cells present. An open biopsy can be performed under local or general anesthesia and will leave a small scar. Prior to surgery, a radiologist often first marks the lump with a wire, making it easier for the surgeon to find. Monthly breast self-exams should always include a visual inspection, with and without a mirror, to note any changes in contour or texture, and manual inspection in standing and reclining positions to note any unusual lumps or thicknesses. 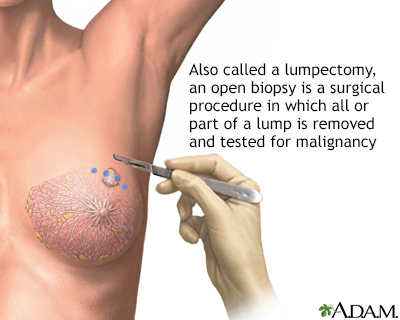 Lumpectomy is a surgical procedure performed on a solid breast mass to determine if it is malignant. The suspicious lump and some surrounding tissue is excised and analyzed. 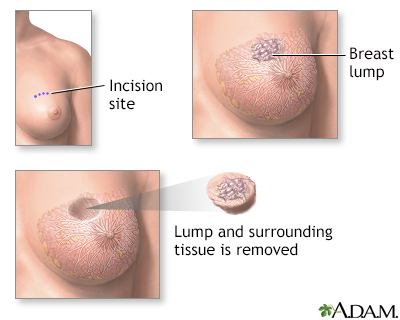 Sentinel node biopsy is a technique which helps determine if a cancer has spread (metastisized), or is contained locally. When a cancer has been detected, often the next step is to find the lymph node closest to the tumor site and retrieve it for analysis. 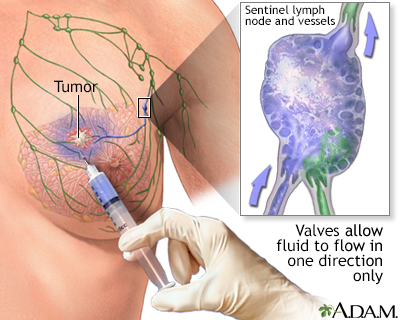 The concept of the sentinel node, or the first node to drain the area of the cancer, allows a more accurate staging of the cancer, and leaves unaffected nodes behind to continue the important job of draining fluids. 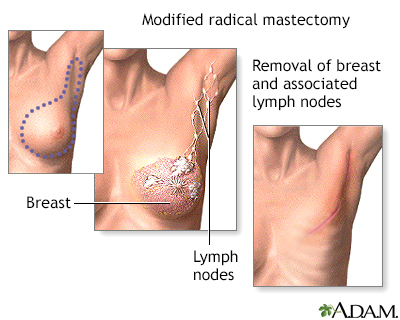 The procedure involves the injection of a dye (sometimes mildly radioactive) to pinpoint the lymph node which is closest to the cancer site. Sentinel node biopsy is used to stage many kinds of cancer, including lung and skin (melanoma). Reviewed By: Todd Gersten, MD, Hematology/Oncology, Florida Cancer Specialists & Research Institute, Wellington, FL. Review provided by VeriMed Healthcare Network. Internal review and update on 01/19/2019 by David Zieve, MD, MHA, Medical Director, Brenda Conaway, Editorial Director, and the A.D.A.M. Editorial team. Editorial update 04/12/2019.